Because of its popularity, many think Team Fortress 2 sprang to life fully formed without precedent, like Athena from the forehead of Zeus. Or Leonard Part VI. It in fact is a series, one that is now 15 years old. 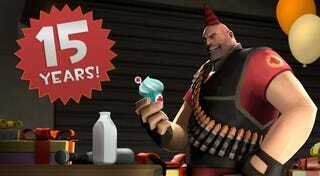 So Valve is giving out free stuff, and as you might imagine, that includes a party hat, and also a noisemaker that will work only on Team Fortress's birthday (Aug. 24) going forward. Health kits and ammo packs will be remodeled with birthday themes, and past birthday gifts, including the Beach Ball and the "Celebration Gib" which causes gibbed players to explode in a shower of balloons and confetti, will reappear. The festivities began today (Aug. 24) and will continue for the next 24 hours, says Valve, so it's still going on.